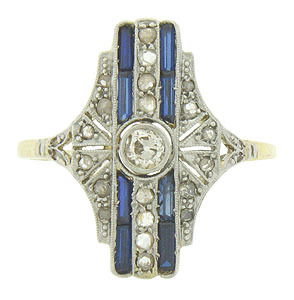 This captivating Art Deco engagement ring features strings of baguette cut sapphires and brilliant round cut diamonds. 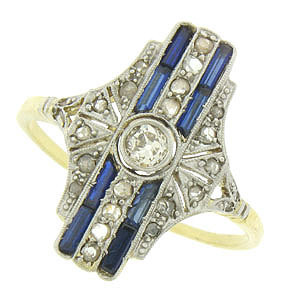 Geometric cutwork decorated with fine faceted diamonds, engraving and distinctive milgrain design cover the surface of the ring. 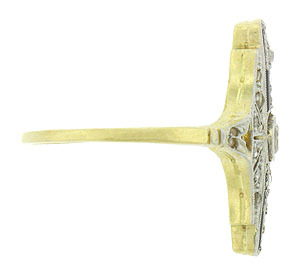 The face of the ring is fashioned of 18K white gold, while the shank is finished in yellow gold. 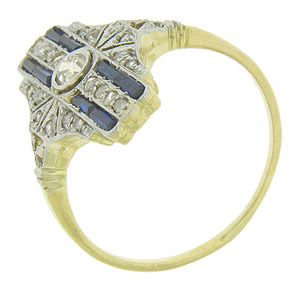 The ring measures 18.85 mm in width. Circa: 1920. Size 6 1/4.